Within our HIPAA COMPLETE or ALL-IN-ONE PACKAGES, we provide you with a government-issued template, that allows you to complete your Risk Assessment Report. Many of our clients have found this to be cumbersome, time-consuming, difficult-to-read, understand and fill-out. 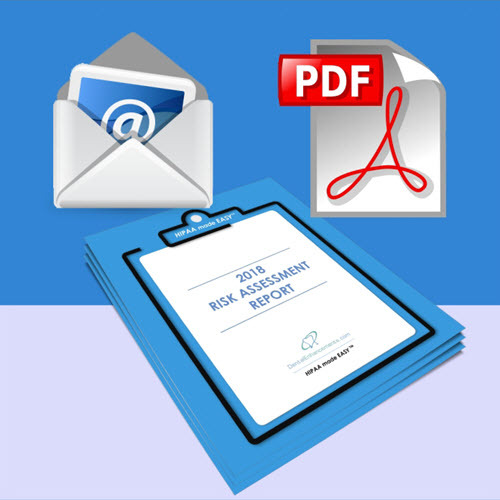 In an effort to streamline your efforts in completing this requirement and save time too, we now offer the DE RISK ASSESSMENT REPORT – Fillable-Form PDF. It’s straightforward language design, fillable-format– paired with a 30 minute HIPAA coaching session from one of our HIPAA experts, will have you compliant in no time! Our solution will save you up to 8 hours in valuable time and many of the required answers are already within our template! Compared to other Risk Assessment Report options (priced between $2000-$3000), our solution is the smart, efficient choice!